To identify people who can help you access duty bearers relevant to your advocacy or campaigning work. Draw up a table like the one above. On the left, list all the stakeholders you need to influence, but cannot access. This could include people you need information or permission from to do something. It could also include the decision-makers you hope to convince to take action in your favour. In the next columns, list all the people you believe act as formal and informal gatekeepers to the stakeholders in your first list. This will probably require some networking and research on your part. Underline or highlight the gatekeepers on these lists whom you know or could quite easily gain access to. In the right-hand column, list the people who act as gatekeepers to the gatekeepers. Again, underline any of these you have an existing relationship with. You might be able to ask them to introduce you to the gatekeepers. 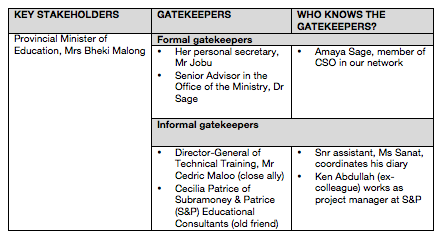 The challenge is to identify who amongst your possible partners may know or be gatekeepers to powerful stakeholders. In many instances, it may also be necessary to forge new relationships to ‘get your foot in the door’ of particular spaces you are trying to access. Many decisions are made behind closed doors. You could lobby to open up this closed space for civil society participation. However, it may also be feasible (and possibly more strategic) to engage your stakeholder in a forum not related to your issue, building a relationship with them in a space that is easier to access. Accountability – Quality and equity in public service provision, HRBA Governance Resources, ActionAid, 2012. Power – Elite capture and hidden influence, HRBA Governance Resources, ActionAid, 2012. This tool is important for advocacy process mainly in the campaign process. in Mozambique we use the tool regularly the actually action was when we summit the petition related to alternatives to finance education in Mozambique and also in the Petition to revise Double Taxation Treats In Mozambique. I have hear a lot about the IFAS work - very inspiring!